Stride hopped on the vitamin bandwagon with their new line, Stride Spark. 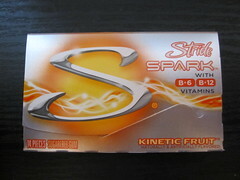 Although I tend to disregard the vitamin aspect, I am a sucker for new products and citrus gum, so I picked up Stride Spark Kinetic Fruit for $1.29 at the grocery store. B6 and B12 vitamins aside, the swirly, metallic packaging caught my eye. I only assumed it was a citrus gum because of the orange on the packaging - Kinectic Fruit isn't terribly descriptive. Initially, the gum had a great sour orange flavor, and the best comparison I can think of is orange Tic Tacs (a childhood favorite of mine). There were small crystals in the gum that gave it a slightly crackly texture as I chewed - probably the Spark. The tart flavor lasted around 10 minutes, if I remember correctly, though the leftover weakened orange flavor wasn't bad. 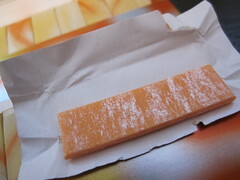 The gum didn't get too soft or too hard, so there were no issues with texture. I found myself chewing until the flavor faded, then getting a new piece to enjoy the orange flavor again. Check out another review at The Impulsive Buy.